Long ago, in a faraway land lived an ancient tribe. The crones and elders sat in council together and the children gathered to listen to their spellbinding stories. Story time was a ceremony of the utmost importance and happened after each member of the tribe had attended to their duties towards the community, whether it was gathering roots and berries, planting seed and harvesting the crops according to season, or milking the cows. Everybody was there. People would gather in circle, and the children and the youngsters would sit in two inner circles, with the shaman placed at the very centre. When the time was ripe, the tribe would sit under a sacred tree. It was so huge and sturdy, with an upright trunk and twisted roots that surfaced on the ground, only to push deeper into the earth; its branches spread out in all directions so high in the sky that on cloudy days it seemed they were scratching the clouds themselves. Nobody knew how the sacred tree had grown in those flat lands. They said it was a gift from the gods. They said it had sprung up above the land overnight. It was a unique tree, the only one of its species. In stormy nights, it glared like a huge eye and licked the dark sky like a huge tongue of fire. Jemai's head was full of the stories about the sacred tree. Soon, he would come of age. This was to be the last time he listened to the shaman's stories before going out alone in the wilderness. On this special special evening, as the sun lowered on the horizon, he sat in his circle and waited for the ceremony to begin. The shaman held his gaze, as he danced and called the spirits of the ancestors to preside over their gathering. "Our sacred tree-- he said -- is a bridge between Father Sky and Mother Earth. 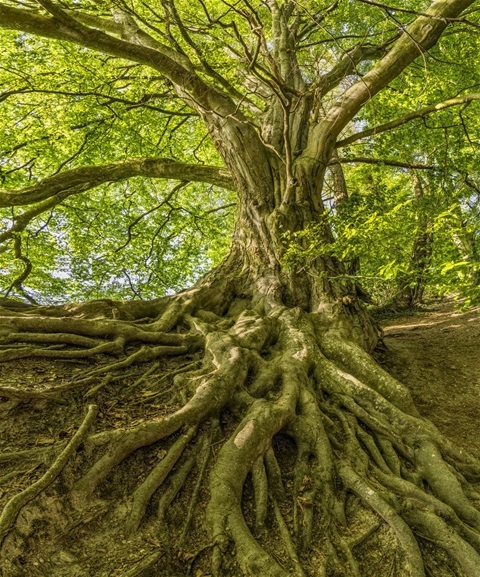 Its roots push beyond the sky and entrails of Mother Earth. They reach deep down into the Great Unknown, where our ancestors dwell." The shaman reported descriptions of a realm of fire and ice, which he had visited on his journeys. There the Great Snake coiled around the roots of the sacred tree and the Red Fox hid in its hollows. "The ancestors say -- the shaman continued staring at Jemai -- that the tree holds a secret, a fiery spear: whoever finds it will bring prosperity to the tribe. Who will go in search of the fiery spear?" "I will" -- said Jemai in a breath. At that, adult men looked at one another; yet, for all their perplexities, they did not want to leave their wives and children. Had the shaman not said that the way was fraught with dangers and there was no guarantee of safe return? The ones who had tried before had either gone mad, or been dispersed, or both, when they had been spared by the jaws of the Great Snake. Jemai left behind no one, for his father had died in the hunt and his mother had died in childbirth. Thus, it was set. That night, they tied Jemai to the trunk of the sacred tree, covered his eyes with a thick plait of leaves and went back to the village. He listened to the voice of the night. Crickets and owls brought him her messages: "Ask the creatures of the night to free you. Go home, Jemai, be safe and leave in peace." But Jemai's will was set. He was born for this quest. Little by little, with his eyes shut, he could feel himself tumbling down a huge hole. He could not make out how far or how long. He just knew he was descending down below. He landed in a dark, narrow hall, where eyes like fiery embers were watching him in silence. In the free fall, he had lost his bindings and the plait of leaves. The only sound he could make out was the hissing of the Great Snake. "You've come for the spear, have you not," he said. The malevolent ember eyes were still watching him. Jemai looked away, for he knew those eyes had the power to drive everyone crazy. "Who are you? Why should we give the fiery spear to you? Has your tribe run out of grown men? Or are they afraid?" "I have nothing to lose," Jemai said. "Ah, very brave of you"-- said the Great Snake, " we shall give you the fiery spear on one condition. Fulfil it, and you will have it. Fail, and you will die the most awful death." "What is your condition? I am not scared." "You will spend one whole year in our kingdom, never uttering a single word, no matter your circumstances. If you let the faintest sound out, you are done for. You will never see the light of the day or the starry night again. Your tribe will forget you ever trod upon the earth. Do you accept?" Time went slowly, especially because Jemai didn't have a way of measuring it: there was no sun, moon or stars in the Great Unknown. He could only observe in silence the pale hosts of sighing ancestors. He would bite his lips till bleeding, in order to prevent himself from speaking and asking them questions. When his time in the Great Unknown was almost over, his parents came forward, reaching out to him, asking questions, and looking sad and spent when he did not answer. Jemai saw his mother for the first time and imagined she must have been beautiful when alive. His father's torso was still marred by the wound inflicted by the boar he had been hunting. Other spirits came along coaxing him into speech, in vain. Jemai closed his eyes, bit his lips and put his hands on his ears. Then he collapsed into a dumb, heavy slumber. When the tribesmen found him, they could not trust their own eyes. Jemai was lying down beneath the canopy of the sacred tree, covering the long fiery spear with his body. He had grown tall and brawny. The point of the spear glinted where the sun hit it. They tried to recover the spear first, but Jemai was so bulky and heavy that it was outright impossible, so they woke him up. It took a while for Jemai to come back from the depths of the Great Unknown. When he sat up, and opened his eyes, he stared blankly at the sun: he was blind. The women gave him water and food, which he devoured. He stood up. At first he was out of balance. Yet, he refused support from the men. He uttered just a few words, for he had learnt the value of silence. Soon he stood upright and walked away. Everybody respected him, for he had been to the Great Unknown and back. He had gained the fiery spear and had grown into an implacable warrior, who was able to defend his tribe from all danger, and guide them in times of need. Jemai was the only mortal man who could wield the fiery spear. The fame of Jemai, the Blind Warrior, reached the corners of the world, but nobody ever knew the secrets of his heart.